Completely renovated 2 bedroom suite in restored character 8-plex located right at the Rockland/Oak Bay border. This central location is just minutes away to everything: Dallas Road oceanfront, Cook Street Village, Downtown, Oak Bay Village and Fernwood Village. Walk to local attractions, such as Craigdarroch Castle, the Art Gallery of Greater Victoria, or shop along antique row, all less than a 5 minute walk away. Grab a bite to eat or shop for groceries right across the street at the Stadacona Center. Take a lovely stroll or play tennis at Stadacona park, also just one block away. This 2 bedroom suite has just been completely renovated in June 2012. Everything was newly redone, including a brand new kitchen with new shaker cabinets, eat-in peninsula, granite counters, stainless steel appliances, plus dishwasher. The bathroom is redone with new tiles, new vanity and granite countertop. The suite comes fully equipped with brand new furniture, appliances and everything else you need to enjoy your stay in Victoria. The living room has a sectional sofa, 42” plasma TV with digital cable and Bluray/DVD player. The kitchen comes with all cookware, plates and cutlery. 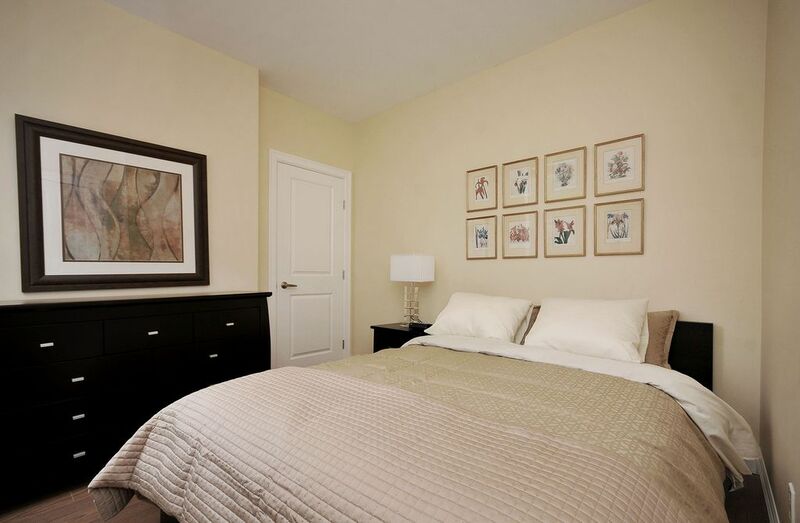 Both bedrooms have matching queen size bed sets with dressers and side tables. Fresh towels, linens and wireless internet are all included as well. Several bus stops that will take you anywhere in the city are at the corner. Coin operated laundry machine on site. We had a pleasant one month stay in this recently renovated, neat and clean two bedroom suite. The suite was comfortable and met our needs. This suite on the back of the building (Suite 1) was very q unite despite being located on a relatively busy street. The Manager was available on short notice and was responsive to calls. Minor maintenance items tend to be deferred to the end of the stay. Pricing appeared competitive and parking was included. Common spaces were clean and maintained. The suite is centrally located but major grocery shopping can we a challenge without a car. Larger grocery outlets are a 20 minute walk away. Given the opportunity, we would stay here again. Decent location, 1-1.5 miles from Wharf and shopping. Very affordable apartment with 2-bedrooms + kitchen + pet. Neat neighborhood with plenty of large homes/mansions for walking + a castle near-by. Shine cafe is fun and good food to walk to. It would be better if the beds were more comfortable and more towels and nicer amenities in the place. Also, would be better if close enough to walk to more stores/shopping. Very clean, comfortable and quiet. Well equipped kitchen. Close to buses to downtown and Fisherman's Wharf. We had a really great stay in Victoria, BC at this property. The apartment was exactly as described and the location is excellent. There are a few shops/restaurants right across the street, the castle in walking distance and downtown just a 5 minute drive or 15 minute walk away. The interior has been nicely updated and there is a dedicated parking space in the back off the street which was nice and plenty big. The beds were medium firmness and the couch also was a fold out bed as well, which worked out for us too. Our host was great and responsive and overall we had no notable issues. A few things to note were that the building has some construction going on outside right now to install a new walkway. It is a nice upgrade and they worked during daytime hours, so it was no problem for us, but just FYI. Also, it was warmer this week and the apartment has no A/C. We opened the windows and got decent air in and there are 2 fans in the apartment too. For folks like us used to A/C, just something to be aware of too. You also enter through a common door, so you need to make sure to close it tightly as well. Charming and close to downtown! Updated and modern 2 bedroom suite within minutes from downtown. Great location! We stayed in this suite for 2 months and it felt like home. Definitely recommend for short or long term! Very nice, clean unit. In general a very nice place to stay. A bit closer to the main road than anticipated, so a tad bit louder than expected.